With Star Wars Celebration happening yet again, I am very excited that it is taking place! 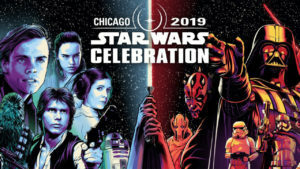 It is a wonderful fan event for the fans to both meet each other as well as hearing from their favorite Star Wars creators and also hear Star Wars news being revealed to them. Despite missing out on re-connecting with fellow fans and meeting new ones, as well as missing out on the cool experience, I do, however, hope to follow along online and see what’s going on with the news. I hope that those at Star Wars Celebration Chicago are greatly enjoying their time and I look forward to hearing about the news in Star Wars!